Once again this year we had the opportunity to pick blueberries at my husband’s grandfather’s house. Store bought blueberries don’t even come close to how delicious these one taste. We ended up picking about 12 quarts of blueberries. I froze half of them and we’ve been eating the other half on yogurt and just snacking on them. 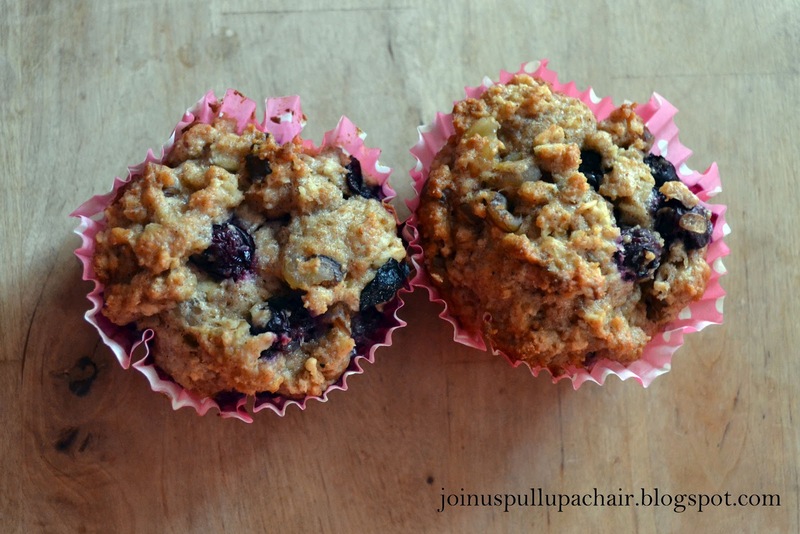 As you know, I love muffins and figured it would be a great time to make muffins with our fresh blueberries. I’ve made blueberry muffins before, but wanted to try to make them healthier using whole wheat flour. These muffins turned out perfect. I love the texture the whole wheat flour and the oats add and they’re super moist. Preheat oven to 400 degrees. Line a muffin tin with paper liners; set aside. In a large bowl combine the flour, oats, sugar, baking powder, cinnamon, baking soda and salt. In a small bowl, combine the egg, yogurt, and butter. Add the wet ingredients to the dry ingredients and stir just until moistened. Fold in the blueberries and walnuts. The batter will be very thick. Fill the muffin tins 3/4 full with the batter. Bake for 22-25 minutes or until a toothpick comes out clean. Cool for 5 minutes before removing from the pan and then continue cooling on a wire rack. Here’s some of my other blueberry muffin recipes!